Rudolf Hasse signed Nürburgring Postcard. 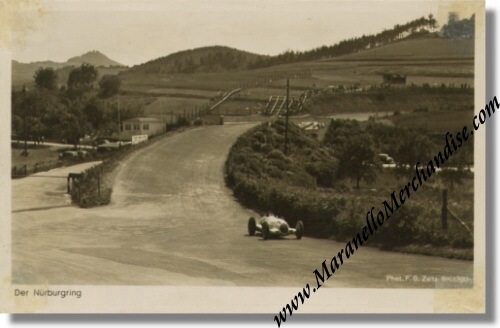 This is a vintage 1939 postcard of the Nürburgring (with a Mercedes Benz depicted on it) which has been signed by Auto Union ace, Rudolf Hasse. 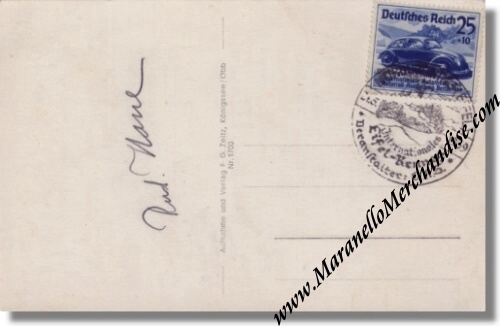 The postcard has one of the Nürburgring postage stamps on it with the commemorative canceling, dated May, 2 1939. This postcard has NOT run. Hasse was signed on by Auto Union in 1936 and would race for them until the beginning of WW2. In total he competed in 12 Grand Prix, winning the 1937 Belgian Grand Prix. Hasse died in August 1942 at Nazi Germany's eastern front.